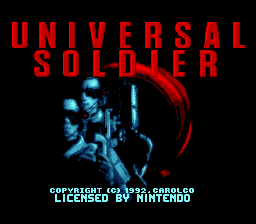 This is a prototype of the unreleased game, Universal Soldier, which is a rebranded version of Turrican 2. Thanks to Retromags for the magazine scans, and Frank Cifaldi for the high resolution box scan. 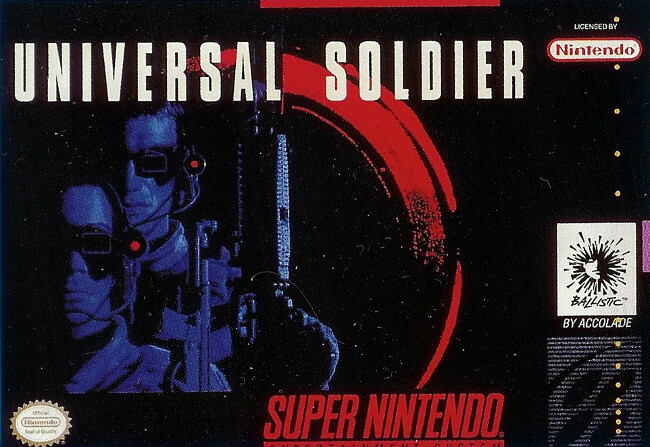 Universal Soldier was to be published by Accolade. 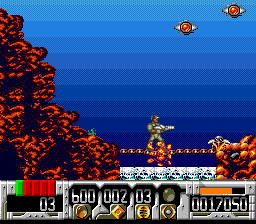 The game was actually a sequel to the Manfred Trentz game, Turrican, but the character sprite was changed so that it could be rebranded as a movie tie-in. 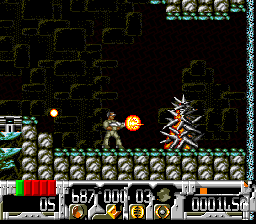 This included adding several new levels to make the link more clear. 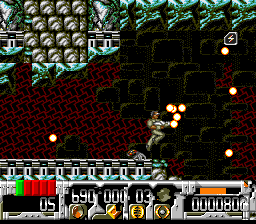 The enemies and gameplay closely match Turrican, as to be expected. It is unknown why this game was canceled. 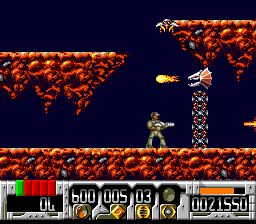 Genesis and Game Boy versions of this game were released, and Turrican 2 was released on various computer platforms. Nintendo Power commented in the October 1992 issue that it was similar to Contra, but complained about the poor controls. 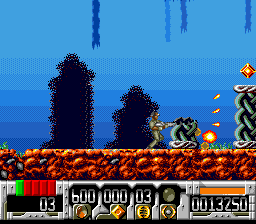 The ROM image of this originates from a scene release by the group PONG. They released this on August 26, 1992. ||   __  \\  ||   __|   | ||   ____| | |    _____|     . :.++     ||  |  \  \\ ||  |  |   | ||  |  |   | |   |  ___      ..
: +:+   |   |     /  |   |__|  || |   |  |  || ||  |_|   |     .+. +  |   |          |________| |___|  |___| |___|_____|   +. There is also a presumably hacked version of the game floating around. In addition to changing the header to make it appear to have a good checksum, there is also a change in the credits, where middle initial of producer "Chris W Bankston" has been changed to a "B". The original scene release version is correct (according to other games he is credited in). Two other bytes are changed at 0x7ED and 0x9F8, but I am unsure of the purpose. I played the game for a while, and quit after the third level when it was not clear where I was supposed to go. The levels are huge! 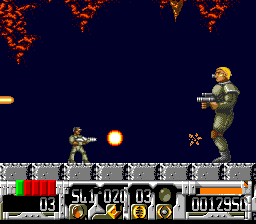 After watching footage of the Amiga version of the game, it is a huge disappointment, with worse sound, graphics and presumably controls (although not as bad as made out by Nintendo Power). 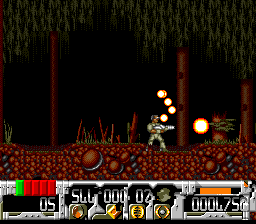 Although this game is based on Universal Soldier, the futuristic enemies from Turrican II are still the same. The robot boss has been changed to the Dolph Lundgren character, though. Frank Cifaldi sent me some high resolution box art for the game. If I recall correctly, this came from a handout that was from a trade show. This game did get some coverage in game magazines. There was a full two page preview in the September 1992 issue of EGM. The EGM preview states it is 95% complete, and that it would be released in the last quarter of 1992. There was a small mention of the game in the October issue of Nintendo power, as mentioned above. 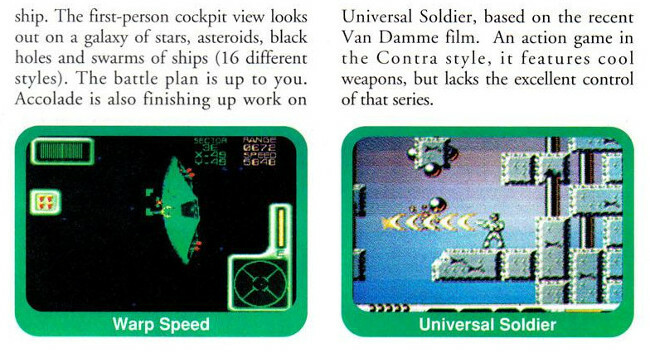 Given the timing of these previews, it is probably safe to assume that the prototype was the same as what was previewed in these magazines (and may not be the final version of the game). 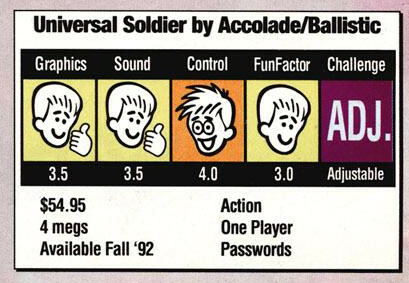 The game was also reviewed in the October 1992 issue of Gamepro, where it got mediocre scores. Finally, the game was mentioned in a preview of Super Turrican in the April 1993 issue of Nintendo Power, but it seemed to imply that the game was likely cancelled at that point.